The last words of people when they are about to die have always been of great interest to me. They tell you so much about what the person considers truly important. Such things can be as shockingly bankrupt as they might be blindly oblivious or stunningly blessed. Sometimes death comes unexpectedly and the last words of those who die in such a manner are often extraordinarily mundane. Others, who are aware of what is about to take place, demonstrate either their true grasp of it, or their unwillingness to face it and retreat to simply ignoring it. Tallulah Bankhead, actress of a previous generation simply said: “Codeine…Bourbon” – and perished as she had lived. A slave to those substances. Vittoria Accoramboni – a famous Italian noblewoman of the 16th century – had her husband murdered so she could marry another. Being murdered herself at the age of 28 blasphemously said: “Jesus, I pardon you.” As though God was responsible for her sin and its wages. I gave up too many sins. I studied my Bible too much. I worshipped God far too often. I loved Christ and His people too much. Such sentiments never appear. Never. And it does not take much thought to figure out why not. Peter, like a good father to his children, under the direction of the Spirit is putting forth his last words to them in this letter. 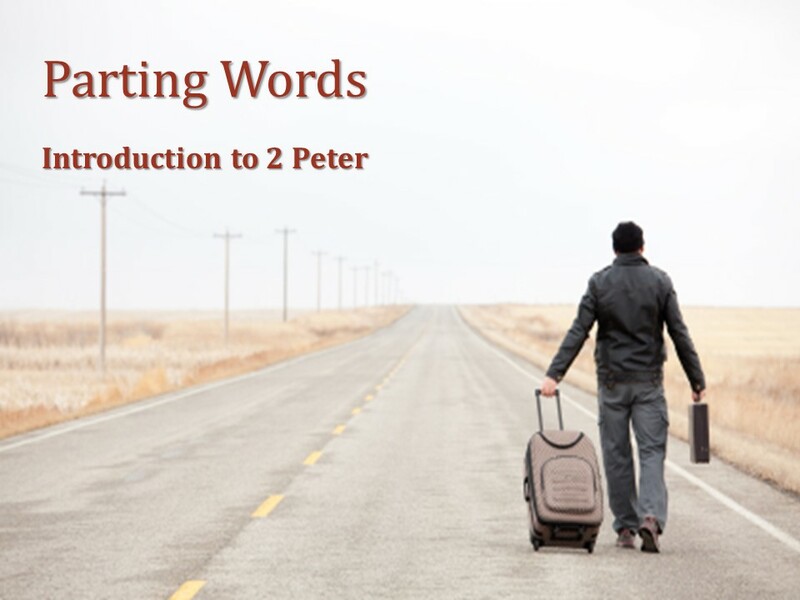 Before we begin to unpack some of that, it might be helpful to go back and get a feel for Peter’s situation as he wrote – and the situation of those he was writing to. This would have put Peter in Rome as the beginning of the persecutions of Nero – as most history and tradition agree. 2. Situation of his readers: As in 1 Peter, Jewish & Gentile Believers, banished from Rome to the backwaters of Roman outposts. 3. Driving Concern in Peter’s mind: That he leave them a Memorable Legacy. Which legacy is not wrapped up in being sure they remember HIM well and fondly or in terms of greatness – but that they remember what he taught as the things of highest importance to the Believer in this world – all centered in the knowledge of the person and work of Jesus. So, he then organizes his thoughts around three things: And the chapters follow that outline fairly closely with just a smidge of overlap in places. Chap. 1 / The Foundation of the Believer’s Life and Thought. Drawing from his first letter, he is adamant once again to help the Believer establish in their own hearts and minds who they really are in Christ Jesus. A true, Biblical Christian identity. Then, he focuses upon what God has provided for us to live out this identity in a fallen and variously hostile world. All wrapped up in the supreme gift of Christ to the Church in His resurrection – that of the Holy Spirit. And lastly, that we keep in mind that God has a plan, a program for the ages that He is carrying out. Life is not just some random, pointless existence. God is moving all of human history toward a specific end, and only the one born again by the Spirit of Christ gets to live in that reality. This infuses every experience in life, every decision and life circumstance with meaning and potential to impact our eternal existence. Chap. 2 / A Forewarning of the most Formidable Challenge they will face. A warning against the doctrines they espouse. While that sounds spiritual, it is in fact quite naïve. Doctrine, is nothing more than what the Bible teaches, and certainly nothing less. And each of us HAS, whether we identify it as such or not – a “doctrine” of Jesus Christ: Who He was and is and what He came for, accomplished and rose again to do. And what that means for the future. Chap. 3 / A look at the Future they are to be Living and Striving for. Future glory for the saints as motivation for how we live here and now. Future judgment for all of those outside of Christ. That this present existence will in fact come to an end. Christ will return. This age will give way to the new heaven and the new earth as prophesied. The world will not just spin endlessly as it does now, and no one will simply cease to exist – but how and where and under what conditions we will spend eternity is fused together with how we lived here and now, most especially in relation to Jesus Christ as King. By means of a practical application, we might well ask ourselves what it is we are leaving those who come behind us? Both our own children and/or grandchildren, and the generations of the Church who will follow us should the Lord delay His return. To you parents and grandparents here – what will you leave your heirs with? What will you have passed on to them? Will that be simply material? If spiritual, what will that look like? What will they take away from having lived with you and watched you and listened to you as vital and important? Not what you SAID was important, but what you actually demonstrated by your commitment of time and money and pursuit. What captured your fondest attention? Did you give them any sense of what is worth pursuing and why? Have you told them why you lived as you live, and how you made the decisions you made? And will it be useful for the state of their everlasting souls? I am so grateful that I can look to the example of my own Mom & Dad in this regard. Oh, they were deeply flawed people – broken and marred by sin as all the rest of us. But the way they lived demonstrated to us that they had spiritual priorities that were to inform and direct everything else in life – in terms of serving the Christ who had saved them from their sins by His substitutionary death. They prayed – because they believed that as God’s adopted children, Father God heard. They read and studied and loved Gods Word because it was to them – God’s Word. They challenged sin in their lives because they wanted to be delivered from it as is commensurate with why they had been saved. They wanted to live as the saying is Coram Deo – before the face of God. And they lived anticipating Christ’s return, or going to be with Him in death. This is the legacy they left us as their children. The same legacy I trust I am leaving for my own daughter and grandchildren. Not a legacy of religious perfectionism, but of the pursuit of holiness out of gratitude for salvation and the desire to live in concert with Christ’s goal of freeing me to be conformed to His image. The lyrics to Steve Green’s song ”Find us Faithful” come to mind. But the real force of this example is in how Peter emulates and brings attention to how it is Christ Jesus has provided for us. This is the heritage of the Christian. This is the wonder that Christ has secured for us. He has opened our eyes through the Gospel to our lost condition apart from Christ. His Word has informed us of how God created us for Himself, and how sin came and ruined mankind, separating us from the source of both physical and everlasting life – leaving the human race under the awful judgment of God. How Jesus, God in human flesh came, and died for our sin on the cross of Calvary – taking the just wrath of God against us upon Himself, that we might be reconciled to the Father, forgiven of our sin and guilt, and made new creations in Him. And promises that all who trust in His atoning sacrifice may be born again, adopted in the very family of God, and have everlasting life. Beloved – what a heritage we have been left! Now, may we leave that same glorious Gospel to those who follow us – not in word only, but in lives lived in the these things being the central and absolute essentials of living in God’s reality in this universe. This is Peter’s emphasis. Seeing all that has been provided for us, ought to impact us in powerful ways. Since we are IN Christ, BY Christ, let us be occupied with His person and work until we are at last one WITH Christ in glory.